Retired US Navy RADM C.J. Jaynes will be the keynote speaker for the annual St. Mary’s County National Women’s History Month Banquet. The dinner will be held Thursday, March 14, 2019, at the Southern Maryland Higher Education Center and will feature presentations of the 2019 Lifetime Achievement, Woman of the Year, and Tomorrow’s Woman awards. RADM Jaynes graduated from Indiana University of Pennsylvania in 1979 with a Bachelor of Science in mathematics education, followed by a master’s in mathematics in 1982. Shortly after that, she began a US Navy career at the Officer Candidate School in Newport, RI. At the time she entered OCS, women represented only 9 percent of the ranking officers in the Navy. She describes feeling lonely and being “over-scrutinized” because of her gender. 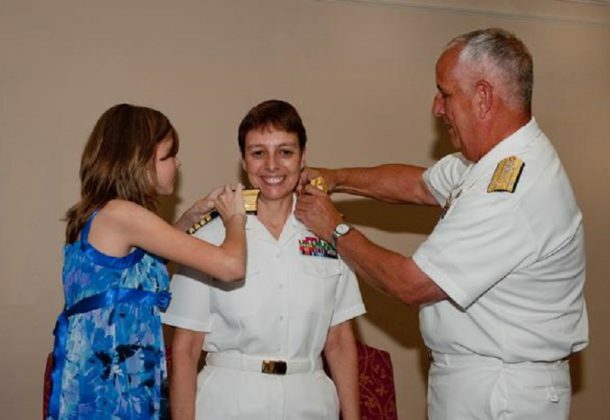 Despite obstacles she faced, RADM Jaynes achieved the ultimate honor – she was the first female promoted to the rank of admiral while stationed at Naval Air Systems Command Patuxent River. Her distinguished 33-year career culminated in her retirement as a rear admiral. Following her retirement, Ms. Jaynes continued to support the aerospace industry in various management roles. She currently provides consulting services to industry and government entities, specializing in acquisition, program management, logistics, industrial operations, strategy, and leadership. A symbol of the 2019 Commission for Women Theme “Visionary Women: Champions of Peace & Non-Violence,” RADM Jaynes is a champion of peace and non-violence. Her dedication to her career and continuing support of the aerospace industry in peace-keeping efforts throughout the world exemplify these qualities. She is an advocate and mentor for young women offering solutions and guidance for achieving success.